Nestaflex is owned by Flexible Material Handling. Nestaflex gravity and powered flexible conveyors expand, contract, flex side-to-side, and move to fit the needs of every operation. 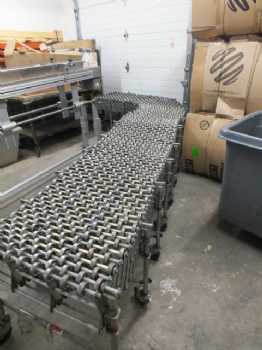 Used as stand-alone or in conjunction with other conveyor systems, our flexible conveyors deliver optimal utility and versatility for distribution centers and retail stores, as well as manufacturing, assembly and processing facilities.